To better understand the variety of strainers used on sprayers, we’ll discuss the most popular types of sprayer strainers used and review what strainer numbers mean. Shaped like the letter Y, the Y strainer is used in various agriculture and industrial liquid flow applications where the amount of debris that will be filtered is small. Often lightweight and made of polypropylene materials, the Y strainer is corrosion-resistant. Its cylindrical shape is very strong and meant to accommodate high pressures. These parts do have pressure ratings so make sure you choose the one that’s suitable for your sprayer system. The T strainer is also shaped like its namesake, the letter T, but this part has a larger holding capacity so depending on its application it will go longer between cleanings. 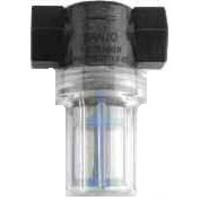 With the T strainer there is the option of purchasing the part with a clear or white bowl, where the clear bowl offers the advantage of easy visibility to check for debris or chemical build-up. T strainers are good at trapping large particles and offer dozens of configurations, including self-cleaning strainers, designed for simple and quick cleaning and maintenance. 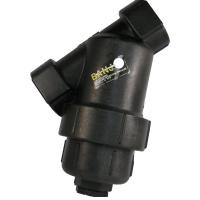 Built-in strainers, or tip strainers, prevent debris from entering the orifice or vane and can be used with a variety of standard and quick-connect flat spray, full cone, hollow cone and fine spray nozzles. These are used in conjunction with another type of strainer and filter out finer particles as a sort of last stop. In general, most sprayer operations can benefit from adding line strainers or integral nozzle strainers. Though if you’re relying on tip strainers alone and these parts begin to plug frequently it may be necessary to add a single line strainer between the pump and the nozzle. From our experience, it’s much easier to clean a single strainer on the main line coming from the pump than to clean all of the individual tip strainers. Strainer numbers represent the number of openings per square inch. The size can range from 10-200 mesh where high mesh numbers have smaller openings and result in a finer screen than low mesh numbers. So a 50 mesh means the strainer has 50 openings per inch. In general 100 mesh tip strainers are required for individual tips with a flow rate below 0.2 gallon per minute (gpm), 50 mesh between 0.2 and 1 gpm, and no strainer over 1 gpm. There are various strainer to sprayer tip combinations to provide the optimal psi, but for the sake of time we’ll save the topic of pressurization for later. In considering the right size for your needs, keep in mind that the main strainer, often called inline or suction strainer, should be the same size or larger than the last strainer on the sprayer pump or boom. Though you don’t need to run strainers on each nozzle as long as you strain the water either into or directly out of all nurse tanks, have a main product strainer on the sprayer, and one strainer for each boom section of the sprayer. When in doubt, call the experts. That’s not all. You also need to consider the type of product you’re spraying because fertilizers need a larger strainer than water based chemicals. All in all, the strainer in your sprayer is one of the most important parts, but also one of the easiest to maintain. A clean and properly sealed strainer will allow proper flow to the pump and contribute to a longer pump life. If you’re looking for more on sprayer strainer maintenance, find out the 3 Reasons Why You Should Check Your Strainer in this post.